Sherman says: What makes a family musical? BUMBLESCRATCH‘s Robert J Sherman has launched a series of blogs on his personal website on various aspects of the show’s creation. We’re excerpting selected blogs here. Please visit robbiesherman.com to read more from this series in full. My father would always refer to the musicals that he wrote as “family musicals” and not “children’s musicals”. Of course the two aren’t mutually exclusive, but there is a significant difference. A family musical contains a narrative that plays on different levels. An eight-year-old will get one thing out of it, while a 48-year-old enjoys completely different aspect. There’s something for every member of the family, from eight to eighty, to relate to and enjoy on different levels. The lesson I learned from my father was something that he, in turn, had learned from a story told to him by Walt Disney. Walt, you see, was inspired after taking his young daughters to the Kiddy Land amusement park in Los Angeles. He noticed that all the parents were sitting around, fairly bored, bystanders, watching their children enjoying on the rides at the theme park. 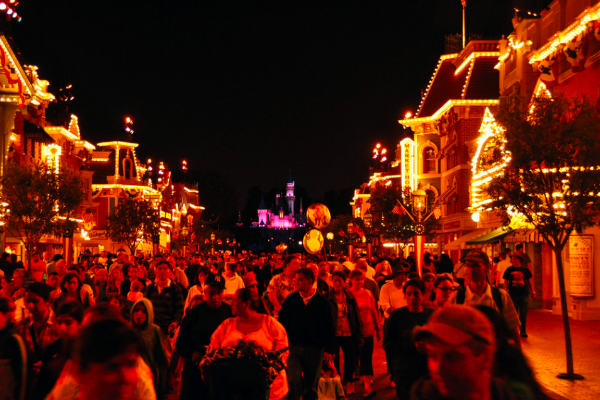 This was the impetus for Disneyland (pictured at night). It’s what made it different from every other theme park that went before it. The attractions appealed (and still appeal) to the adults as well, including rides where they could join their children. Adults love rides too! Disney movies became all about that as well, by the time Snow White was made. This family focus has become very much part of the Sherman philosophy down the generations.